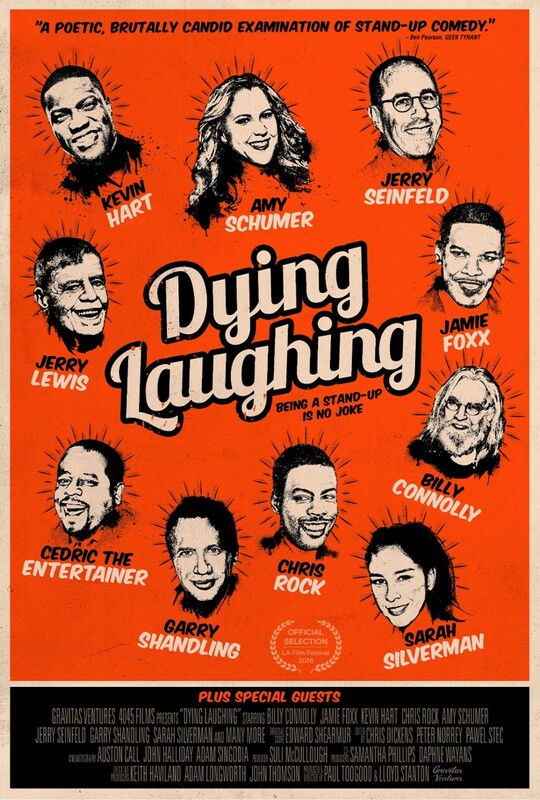 Dying Laughing takes us on a tour of the world of stand-up comedy, in a documentary boasting an impressive cast of talking-heads: Steve Coogan, Amy Schumer, Jerry Lewis, Sarah Silverman, the late Garry Shandling and many, many more. While disappointingly restricted to US/UK comics, it is nonetheless the most in-depth look at the subject we’ve come across. How well can the thoughts of such an expansive cast, on such a wide-open topic, be corralled into a coherent piece? First impressions are not great. Lloyd Stanton and Paul Toogood provide solid, if unspectacular directing: we flit between stock footage of empty stages, dirty motels and rain-swept highways; comedians are interviewed in artistic monochrome. This motif remains largely unchanged across the entire 90 minutes. And It may be that the subject matter does not lend itself to bold or inventive filmmaking. Nonetheless, there is precious little here to hold the interest of the eye when the content starts to lag. Thankfully, though, the content is generally good. It goes without saying that at least a passing interest in the subject matter is required: Dying Laughing largely concerns itself with process and technique, less “This is what stand-up comedy is”, more “This is how these great stand-ups got where they are; this is how they do what they do”. From Kevin Hart going through the list of ideas he keeps on his iPhone (Hart being a stadium performer of such bombastic, shouty energy it never occurred to me he might have a process) to various perspectives on how to handle hecklers (Tiffany Haddish invites them on-stage, Stewart Lee treats their jibes as genuine inquiries), there is a fascinating level of craft insight for those with an interest. Harder subjects are touched upon: One of many dedications in the credits, the spirit of Robin Williams looms over any serious discussion of the form. Stand-ups are often men and women for whom comedy is their primary means of making sense of the world; of themselves. To succeed on-stage is to ride high on a cloud of your own ego; to bomb is not just to fail at a job, it is to fail at being you. To label them all as ‘depressives’ would of course be a gross simplification: As Jim Jeffries puts it, the reputation of stand-ups as a bunch of manic depressives exists – in part – “because it’s the only job where you can get paid to stand there talking about being manic depressed”. Yet, through a series of revealing interviews, we see some truth in it. 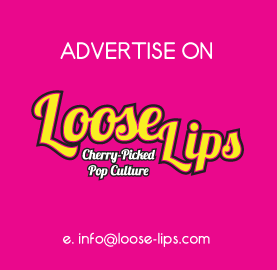 One particular anecdote from U.S. comedian Royale Watkins, in which he breaks down in the midst of recalling his worst on-stage moment, is the heart-breaking, emotional highlight of the film. Moments like this shouldn’t be overstated, however: Dying Laughing is for the most part upbeat, a celebration of the craft. The overriding feeling is one of the being ‘impressed’; at the dedication on display, at the absolute commitment to comedy, through years of poverty, obscurity, and endless gut-punches to the ego. To watch it is to be inspired in your own creative endeavours: Dying Laughing is an affirmation (if one were needed) that the road to creative success has no shortcuts, that it is long, often dark, and that even once it is achieved, the road just keeps on going. One can’t help but wish Dying Laughing was framed in some more visually interesting way, that some of the energy of stand-up had found its way into what is often a workmanlike piece of documentary filmmaking. But, for what it is – for the audience it’s for – Dying Laughing is frequently fascinating, strangely life-affirming and – most importantly – it’s funny. Just plain funny. This entry was posted on Monday, June 5th, 2017 at 8:00 am	and is filed under Comedy, Features, Film, Review.